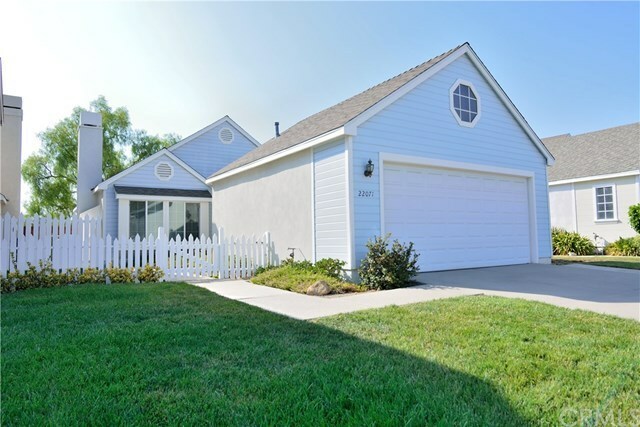 Beautiful one story Cape Cod view home located near Lake Mission Viejo. Light and open floor plan with vaulted ceilings. Living/dining room with new neutral carpeting and cozy brick wood/gas fireplace. Wood blinds throughout. Huge bright country kitchen with newer stainless steel appliances, custom island, canned lighting and hardwood floors. Dual pane low-e Vinyl windows. Paneled doors through out. Remodeled bathrooms. Aluma wood covered patio and yard adjacent Oso creek. Master bedroom with 3/4 bath double sinks. Inside laundry area. Spacious 2nd bedroom. Full bath off hallway. Newer roof and HVAC system. Fresh newly painted interior and exterior. 2 car garage with shelving, workbench and extra storage in rafters. Wiring for TV above fireplace. Award winning schools. Close to shopping, restaurants, little league/soccer fields, parks, walking trails and private Lake Mission Viejo. Hurry this won't last!